To call Maqbool Fida Husain's Gaja Gamini a mere film would be like belittling all that the man's talent typifies and personifies. 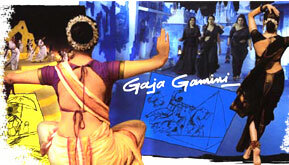 For Gaja Gamini is more than a tribute to a woman -- it is eons of time, all rolled in one. In a film that has no story, no hero, no heroine and certainly no plot, you find everything -- the actors, the stage, the plot, the art and the form. All these faces have been portrayed in a state of timelessness -- in a film that has two sections on screen, separated by a black wall. One is Gyan (represented by Kalidas) and the other is Vigyan (represented by a scientist). It is an irony how the two strongest faces of truth (science and literature) keep bumping into each other at all odd times -- on the ghats of the Benares Ganga, in a jungle of modernity and in the forests where there are strange, leafless bamboo trees, storms, and where the scents of seduction prevail -- and find themselves reacquainting anew, with new wisdoms to impart. The film, per se, has no beginning, no middle and no end. And you are wondering what on earth is going on anyway. Similarly, Gaja Gamini is like a series of miniature tablets of life that keep intersecting and interconnecting at all the stages of life that we have known and read about. Strongly rooted in the principles of Hindutva, Gaja Gamini is the mast that holds all of life aloft -- the elusive walk of the woman, an enchantress, a mystical figure, who has no face, just various avatars. And all the avatars -- Mona Lisa, the muse; Shakuntala, the inspiration; Sangeeta, the enchantress; Munshi Premchand's Nirmala; the rich, but oppressed, Monika; the friend who sees nothing but knows all; Sindhu, the firebrand who is only engaged in destroying evil; Phulwania, the lady who sells flowers, but nurses a gun beneath the blossoms -- they all strike a chord of deep empathy in the heart of the intelligent viewer. Despite the beauty of the canvas that Husain has painted, the excellent dances by Madhuri Dixit in every avatar, and the sheer beauty of direction, Gaja Gamini, it is sad, will want for viewers. At the premiere, held at Bombay's Regal cinema, the huge audience came away feeling cheated. One, because none of the stars turned up for the show. Another, because they could not understand the inherent symbolism of the film. Said Usha Shah, a dowager who came all decked out, "This is sheer nonsense! What sense does this movie make? I was looking forward to seeing Shah Rukh Khan. But he has such a small role! Besides, there is absolutely no romance in the film." Voices of assent were all around her, even as some felt that this was nothing but Husain's way of making an art film in colour to simply showcase his paintings. "There are nore of Husain's paintings of even Madhuri in the film," said Meera Maheshwari, another viewer. "No proper dances -- all the dance is too traditional, and nothing like what one would expect from Madhuri Dixit's regular film," said Prakash Dadlani, who had stood for hours in the hope of getting a ticket. The music, by Bhupen Hazarika, is composed and rendered in his own unique style. Nothing unexpected there -- as a matter of fact, it's good music. What impresses most is Husain's strapping command over Hindu mythology. It is arguable that even the best of them would be able to stand up against his vast well of knowledge, which is applied skillfully applied into every frame of the film. The film ends on a very positive note -- which, once again, is probably Husain's belief -- that of women leading mankind into the new millennium, which is indicated with a humungous gate of mirrors. Since mirrors do not lie -- only the fittest shall survive and pass through. Mallika (Shabana Azmi), who leads the rest into the new millennium, was Nirmala in another time-span. She is now head of the planning commission for the new world order. Beyond a point, one cannot figure out who is leading whom where -- is Monika (yet another Madhuri Dixit in scintillating blue) taking everyone there? Or is it the elusive Gaja Gamini, dressed in a graceful kashta? Beyond a point, all the women are one, and each woman has all of the others in her. Watching Gaja Gamini is like being caught in the middle of a Samuel Beckett play: Instinctively and intuitively, one knows exactly what is happening here. But on the sad surface -- how many care?